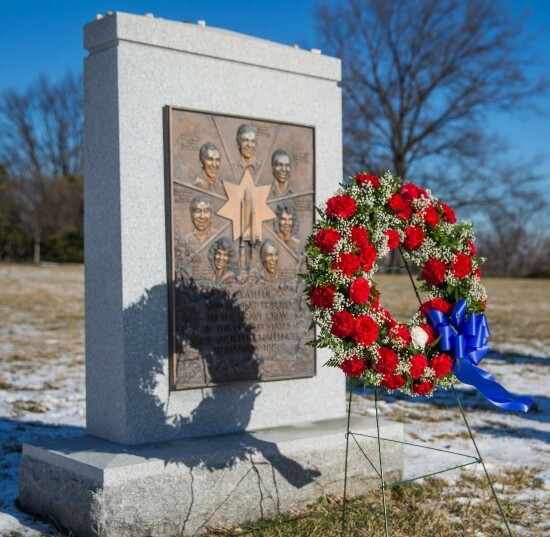 NASA paid tribute to the crews of Apollo 1 and space shuttles Challenger and Columbia, as well as other NASA colleagues, during the agency’s annual Day of Remembrance on Wednesday. NASA’s Day of Remembrance honors members of the NASA family who lost their lives while furthering the cause of exploration and discovery, including Astronaut Ellison Onizuka and six fellow members who died in the explosion of the Challenger shortly after liftoff on Jan. 28, 1986. Also remembered are the three astronauts aboard Apollo 1 who died in a fire in 1967 and the seven-member crew of the Columbia, which broke up during re-entry in 2003. NASA Administrator Charles Bolden and other agency senior officials held an observance and wreath-laying at Arlington National Cemetery in Virginia. Following the wreath-laying ceremony, various NASA centers held remembrance events for their employees. Kennedy Space Center in Florida held a brief ceremony, led by center deputy director Janet Petro, at the Space Mirror Memorial, located on the grounds of the visitors complex. Marshall Space Flight Center in Huntsville, Ala., held a candle-lighting ceremony led by center director Patrick Scheuermann and astronaut Robert “Hoot” Gibson on Thursday.